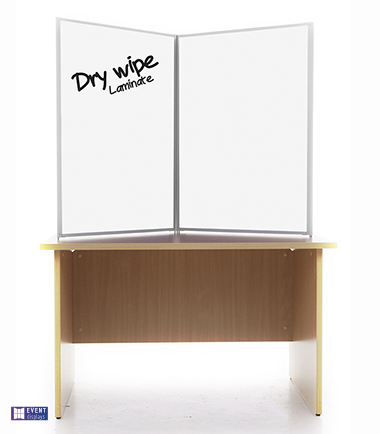 The easy clean table top display boards integrate a drywipe laminate which means that whiteboards are no longer restricted to being wall-mounted. By adapting the finish of the table top display boards, this display system features a flexible and lightweight design which enables it be used in any environment where you have a table on hand. From schools to events, the drywipe surface can be completely customised using drywipe pens. The white gloss high pressure laminate surface adds a smooth and sleek finish which provides a clean backdrop for your display. The fact that the laminate can be customised before and during a presentation makes it extremely adaptable to meet your needs. As the panel is created from a sturdy material, this ensures it is robust, especially when being written onto whilst set up.